Any tips to soldering to a brass baseplate as my skills with this is not up to par when using irons/Gun . feel free to comment . Clean the surface with sand paper, scotch bright, steel wool, or dremel tool! Pre-tin the surface with a good solder like kester 44. The main thing is to have a iron and tip that gets hot enough. Solder with quick hot iron! HOT! Exactly. Then FAST! The idea is that you need to heat the spot where the brass will be soldered fast enough that the rest of the plate doesn't wick heat off that spot before it reaches flow temperature. Then you have to get in and get out because you probably don't want to heat the plate all that much and you don't want to boil the solder. I don't know what T uses. For amp chassis I've used a big Weller gun. That seems like overkill for this, but maybe a higher single wattage solder pencil in the 50W/60W range? Agreed, and an iron that stays hot enough if you're soldering a large or heavy gauge piece of brass. The 80W Weller "pencil" iron with a big heavy tip is my go-to tool for brass sheet, and even makes soldering direct to chassis a breeze. Chuck, that's right, FAST! And BULBOUS! And also TAPERED! Last edited by Leo_Gnardo; 05-19-2018 at 06:21 PM. The 80W Weller "pencil" iron with a big heavy tip is my go-to tool for brass sheet,.. It's great for soldering/un-soldering wires and cap cans to even a thick steel chassis. That's the iron I use for humbucker covers as well. In and out as quickly as possible is the key. The price is nice too, and I think you can still score them under $35. I got mine well-used from a stained glass builder 31 years ago. (Thank you Diane!) In spite of an AC cable on its last legs, it still keeps on truckin'. And when that cable finally goes, I got a spare in my soldering-gear drawer. Everybody should have one. They come in 120 and 160W versions too, for those really BIG jobs. They come in 120 and 160W versions too, for those really BIG jobs. Well if the 80W will handle solder blobs on steel chassis, what qualifies as a "BIG" job?!? Opening canned good without a can opener while simultaneously cooking the contents? Why do you call it "pencil" iron? 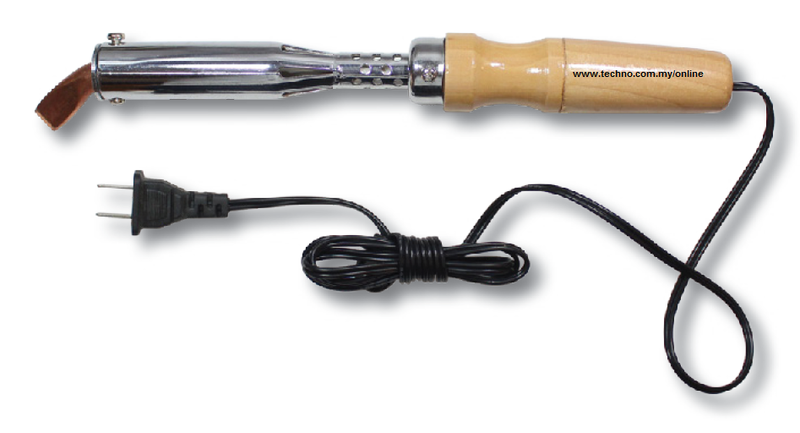 I call it the (old style) soldering iron, the word "pencil" is not even close to describe it. In fact, given the size/weight you do not even*grab* it "like a pencil"
In any case, you need lots of hot copper mass so heat transfers quick and you have solder melting temperature in a second or two. I see & I've followed some advice here to clean the part by sanding & add flux the quickly solder it works best , for this I using the Weller 100/140w soldering Gun. For want of a better term. The 80 or 120 or 160W Wellers in linear form look like giant "pencil" irons. OK maybe a proper "pencil" maxes out at 45W or so. I use the term to differentiate between those and the "pistol" style irons which are usually powered via induction while having a comparatively low mass tip made of square copper wire. And that iron with the bent tip? KOOL! We'll call that one the Bill Clinton model. That's why the "pistol" irons never worked for me in heavy duty applications. For some folks, they work just fine. Doesn't upset me in the least. Y'know what they say, "whatever works." For fun here is a family photo of the "irons" I keep within reach of my bench. It is interesting to note that the mass of the business end of the soldering iron increases faster than the rated wattage. The Weller 100P usually gets the job done when I need to solder to a steel chassis. The big 125W iron was a $1.75 thrift store find. As discussed above, the mass of the tip is important. 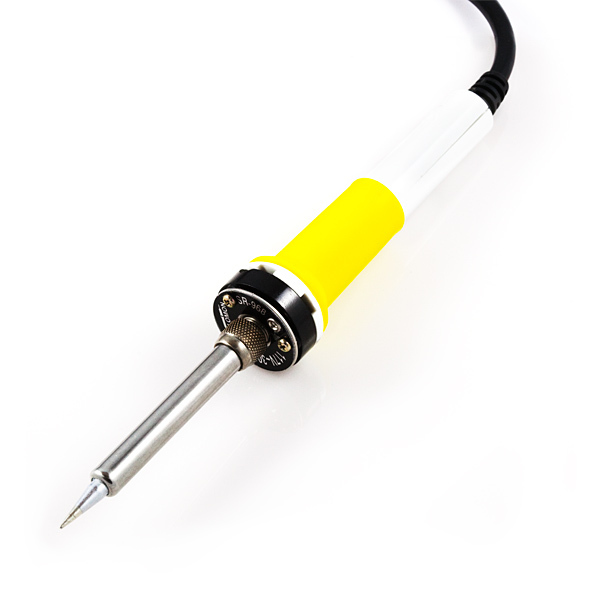 The big Weller 250W soldering gun has a small tip and that's why it does not do a good job soldering to a high mass item even though it has such a high power rating. There is a trick discussed to use that gun with a custom two probe tip to heat a chassis via current flow through the chassis but I have never needed to try that. You need very little prep with this iron , Bought this old Stanley iron at an antique store & just dab & watch the flow on brass , my Weller 140/100 gun is a piece of crap & don't work so well as my 30 watt pencil iron . How powerful of a soldering iron do I need..